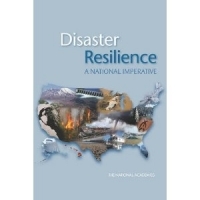 The National Academies’ division on earth and life studies recently published a report on how they believe the nation can increase its natural disaster resilience and preparation to reduce the challenges the nation faces during the aftermath of these events. Clark School civil engineering professor Gerald Galloway served on the committee that offered the report. The report, “Disaster Resilience: A National Imperative,” by the Committee on Increasing Resilience to Hazards and Disasters, is a 260-page report focusing on the necessity of a nationwide enhancement in disaster resilience. The committee refers to resilience as the ability to prepare and plan for, absorb, recover from and successfully adapt to adverse events. They believe actions that move the nation to a greater resilience will reduce many societal and economic problems caused by natural disasters. “Everyone worries about disasters hitting them and we saw that in here in the metro area this summer with the big storms,” said Galloway. “The question we asked is, ‘Could we have been better prepared?’” The committee believes with an enhanced nation-wide resilience, the answer to that question is simply, yes. According to the report, statistics from 2011 show that economic damages from natural disasters cost the United States more than $55 billion, with 14 events exceeding $1 billion each. According to a recent report by USA Today, natural disasters, especially in North America, have been on the rise since 1980. As global temperatures continue to rise and “normal” climate continues to undergo a tremendous change, such natural disasters as floods, tornados, and hurricanes will become more frequent and extreme. With natural disasters seemingly on the rise, the committee feels that if actions are not taken to enhance resilience, the social, economic, and environmental costs will also be on the rise. The committee understands that the road to a more resilient nation is neither easy nor inexpensive. It requires planning, policymaking, organization and communication. The report shows, however, that as arduous as the path may be, it is not impossible to conquer. According to Galloway, the report took about two years to publish. The committee traveled across the country to different areas that have been struck by natural disasters such as New Orleans and the Mississippi Gulf Coast; Cedar Rapids and Iowa City, Iowa; and Southern California. The committee spoke to residents of these places whose lives were strongly affected by these disasters. The report, which was sponsored by the U.S. Departments of Energy, Homeland Security, Commerce, Agriculture and Interior, is available for free through PDF download on the National Academies Press website, or readers can order a prepublication copy for $62.00.